With growing competition between the world’s big players for influence in the Asia-Pacific region, Russia is attempting to cement its economic foothold in Vietnam and open a “window” onto the ASEAN countries. Moscow is aiming to boost trade with Hanoi to $10 billion in the next five years, principally through developing cooperation in the nuclear, energy and military-technical spheres. A fierce competition has recently erupted between world powers for influence over Vietnam amid territorial disputes in the South China Sea – between China, Vietnam, Malaysia, Brunei, and the Philippines. The most active in this area has been China, which has even gone so far as to start creating artificial islands and constructing military infrastructure on them. The escalation of these territorial disputes has sparked an unprecedented arms race in the region. Meanwhile, the Americans have taken advantage of this situation to regain their influence in Southeast Asia, including reinforcing its military presence in the region and launching the Trans-Pacific Partnership as a counterbalance to Chinese-led free trade agreements. Russia is not directly party to the territorial disputes in the South China Sea, but we cannot say that this topic is beyond its concerns. A change in the balance of forces in the region or, for example, rapprochement between Vietnam and the United States, could threaten Moscow’s position in the energy market, as well as on the arms market. The Russian Federation stands for the peaceful resolution of these territorial disputes, within the framework of international legal norms. Vietnamese diplomats are hoping that Russia will contribute to the solution of this problem, since the country has good relations with China, and Beijing listens to the views of Moscow. In the present situation, it is important for Russia to develop good relations with various regions of the world, in order to reduce the negative impact of Western sanctions. Vietnam is important for Russia in itself, but it can also be viewed as a window into the ASEAN (Association of Southeast Asian Nations) countries. During the years of “reform” and orientation towards the West, at the expense of its own interests, Russia slept through the appearance of powerful and dynamic economies in the Asia-Pacific Region, acting passively and ineffectively on these markets. China has now become Vietnam’s largest trading partner, largely thanks to the establishment of a free trade zone between China and the ASEAN countries. The United States, which lifted sanctions against Vietnam only in 1994, now has reached $36 billion in trade turnover with Hanoi, while trade with the Russian Federation is almost 10 times less – only $3.7 billion. However, according to Prime Minister Dmitry Medvedev, Moscow hopes to bring this figure up to $10 billion within the next five years. Helping in achieving this goal is the signing of a free trade agreement between Vietnam and the EEU, scheduled to take place in the first half of 2015. The importance of developing relations with Vietnam for Russia was highlighted in Russian President Vladimir Putin’s decree “On measures to implement the foreign policy of the Russian Federation,” in which Vietnam is mentioned immediately after China and India, thus being shown as a key strategic partner in Southeast Asia. The Russian Federation has managed to maintain strong positions in Vietnam, primarily in the oil and gas sectors, as well as in energy and in military-technical cooperation. Thus, the joint-venture Vietsovpetro accounts for about half of all the oil produced in Vietnam, while Vietnamese companies are carrying out mining operations in the Russian north and are eyeing the shelf of the Pechora Sea. Large Russian companies are already operating in Vietnam – Gazprom, Gazprom Neft, Russian Railways, Silovye Mashiny, and many others. Nuclear cooperation between the two countries is also developing quite actively. Very soon, Russia hopes to acquire a contract for the construction of the first Vietnamese nuclear power plant – the Ninh Thuan-1 NPP – and a nuclear research center. According to statements by Vietnamese officials, Russia will remain a priority partner for Vietnam in military-technical cooperation. The militaries of the two countries are already working together, with the use of Cam Ranh Air Base a case in point. Yet this has already created friction: On the eve of Dmitry Medvedev’s visit to Vietnam, the Pentagon demanded that Hanoi to stop allowing Russian tanker aircraft to be based at Cam Ranh, since flights by Russian strategic bombers have allegedly complicated the situation at the U.S. military base on Guam Island. The geopolitical aspect should also be taken into account. 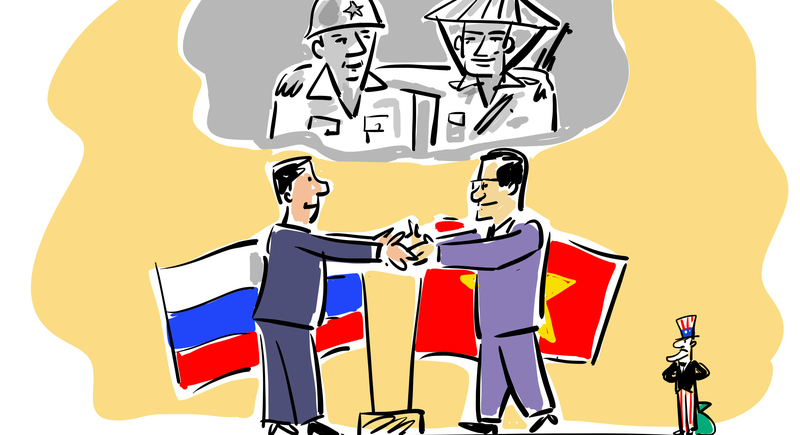 In conditions of increasing competition between different integration formats, under the auspices of Beijing and Washington, Hanoi is interested in expanding cooperation with Russia, as strengthening Moscow’s role in the region does not threaten its security and sovereignty, something which cannot be said about the other players, who in the recent past have used their armed forces against Vietnam. Vietnam's balancing act: Can Russia adapt to change?